Closing the project is the final activity for the project. One of the defining features of a well-planned and managed project is explicit start date and criteria by which the project can be defined as complete with an indicative completion date. After the planning and initiating process is complete it is advisable to include in the completion criteria an estimated date range for completion. This date should be reviewed regularly throughout the project. High-level criteria for closing the project should be defined at the start of the project, then refined during the planning phase and baselined. 2. A premature closure of the project. The project is closed after the final acceptance of the project output. So User acceptance testing and sign off are inputs to this core process. It is quite common for people to see the sign-off of final user acceptance testing as the close of the project. 1. Sign-off on the objectives that have been delivered. 3. Ensure that any objectives not achieved are taken care of either by assigning them to another project, adding them to a list of future initiatives or getting confirmation that they are no longer needed. 4. Confirm ownership of the project output has been handed over to either the operational users or another project. 5. Ensure that any outstanding issues that need to be taken care of have been handed over to the organisation/people that will be responsible for these issues. 6. Lessons learned are documented. 7. Project team is disbanded and each individual has been prepared for their next assignment. Closing a project prematurely can be extremely difficult especially when people’s egos are involved. 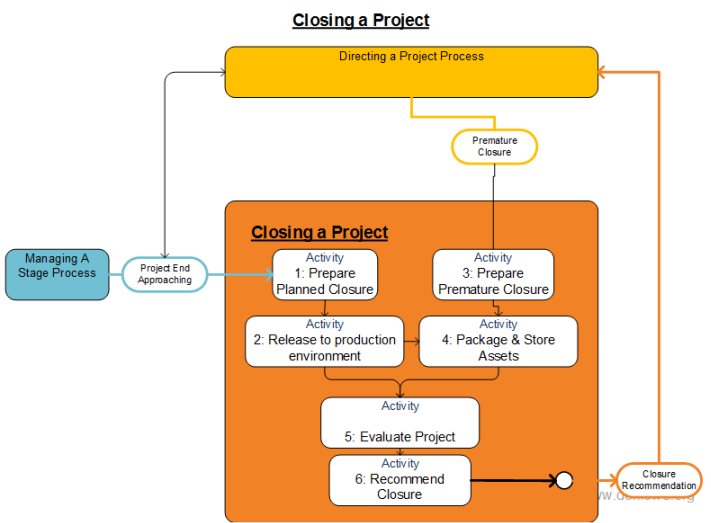 It is good practice to define a set of trigger points against the project objectives at the beginning of the project to initiate the discussion on closing a project before it is completed. 1. Document the decision to close the project and the reasons why this is being done. 2. Sign-off on the objectives that have been delivered. 4. Confirm ownership of the project outputs has been handed over who ever has been designated to take care of these outputs. 6. Project team is disbanded and each individual is prepared for their next assignment.